Five Questions: Chris Murray on Tragic Coleridge | Uncategorized | Aggregated blogs on Romantic Studies - please click through to read full posts. Chris Murray is currently a Junior Research Fellow in the Department of English Studies at Durham University. Previously, he completed a PhD at the University of Warwick, worked at the University of Bristol and taught for two years at Nanyang Technological University in Singapore. His research focuses on dialogues between British Romanticism and works and discourses in other national, historical and generic traditions. His first monograph, Tragic Coleridge, which we discuss in the interview below, was published by Ashgate last year. 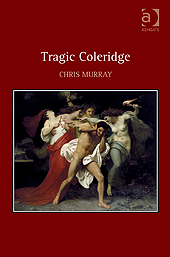 1) How did you first become interested in Coleridge’s uses of tragedy?